Precipitation is on its way, but it’s not snow! 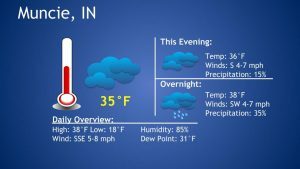 Temperatures will continue to rise throughout the evening and into tomorrow morning as a low-pressure system heads toward Indiana. The subsequent warm front will pass over us, bringing in warmer temperatures in the 40’s and some rain. For now, the temperature is resting at 35 degrees and will reach 38 overnight. Winds will come from the S at 4-7 mph throughout the evening.